Established by the California Legislature in 1914, State Compensation Insurance Fund is a self-supporting, non-profit enterprise that provides workers' compensation insurance to California employers at cost, with no financial obligation to the public. State Fund adjusters, professional loss control representatives, and industrial hygiene and ergonomics specialists are located throughout the state. Our employees provide full services for employers and their injured workers and work to keep costs down. More than120 employer trade associations endorse State Fund for their group insurance programs. State Fund has become a model for the industry and other states by stressing stability, offering coverage at cost, and providing required benefits promptly and fairly. Today's emphasis on customized loss control services, medical cost management, and anti-fraud efforts has found a ready audience among California employers looking to get the maximum value for their workers' compensation dollar. 1911 - Employers seek protection from injury-related litigation, and workers seek assurance of financial support while recovering from work-related injuries. As a result, reformers adopt the Roseberry Act, a voluntary workers’ compensation plan. But few employers opt into the system, leading to calls for stronger laws. 1913 - The Legislature passes the Boynton Act, which creates a no-fault workers’ compensation system and mandates that all employers (with a few exceptions) provide such coverage for their employees. Among its many provisions, the Act establishes a “minimum rate” law to ensure that premiums charged will be sufficient to provide financial stability for the system. 1914 - State Compensation Insurance Fund, established by the Boynton Act, opens its doors at 525 Market Street in San Francisco. Its mission is to provide an available market for workers’ compensation insurance at fair rates, and to serve as a model for all carriers. In accordance with the Boynton Act, State Fund provides coverage at cost while remaining self-supporting. Though the Act appropriates $100,000 to launch the organization, State Fund never uses any of that seed money. Nevertheless, State Fund finishes its first year with $547,161.24 in premium. 1915 - The Industrial Accident Commission recommends the hiring of a traveling medical inspector to “diminish the abuse, now frequent, of over-stay in hospitals” by injured workers. These over-stays, often on the advice of doctors, are causing increased costs. 1918 - State Fund’s overhead costs equal 11.79 percent of net premiums received. Meanwhile, as several State Fund employees leave work to fight in World War I, management solicits replacement office workers aged 16 to 20 for a monthly salary of $40. 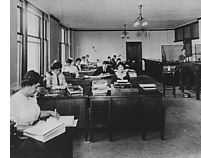 1922 - Management issues a memo to State Fund department heads noting that staff members are using an average of 43 pencils each per year. Subsequently, to control skyrocketing costs, each employee receives only two pencils at a time, and submits stubs of used pencils before receiving replacements. 1929 - The Legislature increases the maximum weekly indemnity payments for an injured worker from $20.83 to $25.00. In the event of a work-related death of a worker with no dependents, a carrier must not only pay $150 in funeral expenses but also contribute $300 to a fund that the Industrial Accident Commission manages. The Insurance Commissioner orders a 4.1 percent rate increase to offset these new costs. 1933 - The State of California announces it has insufficient funds to meet current disbursements, and that it will issue interest-bearing warrants in lieu of checks. However, State Fund continues to make timely payments to injured workers, medical providers, and policyholders, as well as salary payments to its own employees. 1935 - At the height of the Great Depression, 18 private workers’ compensation insurance carriers suffer insolvency, and approximately $2 million in industry claims go unpaid. State Fund, however, continues to pay benefits timely. 1939 - Rates are reduced 8.8 percent. State Fund now employs 475 people, of whom 349 work out of the San Francisco office and 126 are based in Los Angeles. 1945 - New legislation creates a Board of Directors for State Fund, moving it further away from direct State administration. 1952 - Mutual Insurance Agents of California passes a resolution calling on Governor Earl Warren to prohibit State Fund from issuing any policy unless the risk first receives declinations from two private carriers. 1955 - State Fund announces the creation of an Electronic Data Processing Study Team to determine whether this new technology can be integrated into the Fund’s processes. As a result of this study, State Fund purchases an IBM 702 four years later. 1960 - State Fund moves into its new Home Office at 525 Golden Gate Ave., San Francisco. Built for $4.3 million, the facility will house 500 State Fund employees in its top five floors and lease the bottom two floors to tenants. 1968 - State Fund “flattens” its organizational structure by giving increased authority to District Managers. 1972 - State Fund exchanges a parcel of property it owns at 11th and Market Streets for a lot at 9th and Market in San Francisco. 1977 - State Fund moves into its newly completed, 16-story Home Office building at 9th and Market Streets. 1989 - The Legislature adopts reforms designed to reduce medical and legal expenses. 1993 - Governor Pete Wilson signs a new round of reforms to reduce costs and curb abuse of workers’ compensation. The legislation repeals the minimum-rate law, effective in 1995. The new “open rating” plan sets off a period of intense competition among private insurers. While other carriers slash rates to below cost to win increased market share, State Fund maintains adequate rates. As a result, many thousands of employers leave State Fund to obtain lower-priced policies from private carriers. 1996 - As part of his Competitive Government Initiative, Governor Wilson commissions a consulting actuary firm to study the feasibility of “privatizing” State Fund. The business community roundly denounces privatization, and the governor abandons the proposal. 2003 - As result of the severe underpricing since 1995 spurred by open rating, 28 private carriers have either suffered insolvency or have stopped writing workers’ compensation policies in California. Fulfilling its constitutional mandate to provide an available market, State Fund writes policies for many thousands of employers unable to find coverage elsewhere. 2004 - State Fund marks its 90th year of providing workers’ compensation insurance -- and only workers’ compensation insurance. In California -- and only in California. 2005 - State Fund establishes an enhanced Medical Provider Network (MPN) to comply with 2004 reform provisions. New MPN is designed to enhance access to medical treatment for injured workers and reduce medical treatment costs for employers. Over 10,000 health care providers at 10,000 facilities become part of MPN. 2006 - Competition returns to California’s workers’ comp market as savings from 2004 reform materialize. State Fund begins to shed market share, increases reserves and surplus and strengthens financial position. Board of Directors launches thorough internal review of operations and management operations. State Fund continues to focus on enhancing services and products. E-service tool “State Fund Online” is launched to give brokers, policyholders and group administrators 24/7 on-line access to claims and policy information. Two members resign from State Fund’s board over conflict of interest concerns. 2007 – Board of Directors appoints first State Fund President and CEO from private industry. California Department of Insurance (CDI) reviews State Fund operations and provides recommendations. State Fund begins transformative change as it strengthens corporate governance and focuses on improving transparency and accountability within the organization. State Fund expands a broad and popular employer education and outreach program that delivers hundreds of free health and safety seminars to employers throughout California. 2008 – Legislature passes State Fund governance laws that expand the Board of Directors, creates additional exempt executive positions and makes State Fund subject to California Public Records and Bagley-Keene Opening Meeting Acts. State Fund opens new “green” campus facility in Vacaville showcasing sustainable resources and cost effective innovative technology to help reduce energy consumption, shrink carbon footprint, and introduce more environmentally friendly practices into the workplace. State Fund establishes Public Record Office to respond to public’s requests for information. Board of Directors holds first public meeting under the Bagley-Keene Open Meeting Act. 2009 – Wall Street Journal cites President/CEO Jan Frank and State Fund as laudable example of private sector working with government. State Fund logo gets a facelift at 95 years. San Francisco Superior Court Judge Charlotte Walter Woolard exempts State Fund employees from the state’s furlough program. State Fund awarded an “A” grade by the Workers’ Compensation Insurance Rating Bureau (WCIRB) for its exceptional premium-audit function. Award means a two-year exemption from audits by the WCIRB. President and CEO Jan Frank resigns for personal reasons. Board of Directors appoints Chief Risk Officer Doug Stewart as Interim President and CEO. A new advertising campaign that proclaims “We Protect the People Who Keep California Working,” is launched by State Fund. Southern California chapter of Insurance Brokers & Agents (IBA) of the West, a leading regional trade association representing independent insurance agents and insurance brokers, honors State Fund with 2009 Company of the Year Award. The Legislative Analyst’s Office (LAO) says $1 billion revenue projections for the state expected from a proposed sale of some of the assets of State Fund is unrealistic. Gov. Arnold Schwarzenegger taps four new members and reappoints a sitting member to the 11-person State Fund Board of Directors. 2010 – The Board appoints Tom Rowe as State Fund President, CEO and member of the Executive Committee on August 2, 2010. CRO Doug Stewart and CFO Jay Stewart resign. Chief Actuary Jim Neary, President of Claims Linda Hoban, and Chief Operating Officer Harrison Jerome retire in the 4th Quarter. State Fund Executive Committee is restructured to leverage existing strengths, and access required skill sets. Dan Sevilla is named interim CFO in October, and a national search is launched for the positions of CRO & CFO. Tom D. Clark named Chief Operating Officer. Julie Jenkinson and Beatriz Sanchez named Executive Vice Presidents of Claims of the State Fund in December. State Fund announces a plan to reduce its real estate footprint statewide and geographically restructure its operations to serve California more efficiently. The plan includes a reduction of its Home Office presence in San Francisco by transferring a majority of employees to State Fund offices in Pleasanton, Vacaville and Sacramento. The headquarters remains in San Francisco and will house executive, key finance and legal positions. These changes are expected to reduce operating costs by $200m annually when fully implemented in 2013. 2007 CDI review is finalized with all but one recommendation fully or partially remediated. The remaining recommendation will be fully remediated in 2011. Jeanne Cain is honored as she leaves her post as Board Chair. Governor Schwarzenegger names Larry Mulryan Chairman of State Fund. Governor Schwarzenegger appoints Scott Reid to State Fund’s Board. 2011 – Dan Sevilla named CFO in January, after serving in an interim role since October 2010. Ken Van Laar named CRO in January, completing State Fund's national search to fill remaining vacancies on the executive team. Headquarters moved to 333 Bush Street, San Francisco. State Fund Board declares $50 million dividend, the first in more than 10 years. State Fund begins Go Green Initiative aimed at saving $6 million in operating expenses. 2012 – Tom D. Clark retires as COO. Beatriz Sanchez named as Chief Operations Officer. Marjorie Hutchings named Chief Information Officer. Governor Brown reappoints Daniel M. Curtin and Thomas E. Rankin to State Fund Board. State Fund Board declares $100 million dividend. SB 863, major workers’ compensation reform to raise permanent disability benefits and cost savings to the system, signed by Governor Brown. 2013 – Robin Baker and Marvin Kropke named to State Fund Board by Governor Brown. PriceNow, a new pricing tool, introduced to access prices and improve quote speed. Tiered Rating introduced to improve State Fund’s ability accurately price accounts. State Fund Board declares another $100 million dividend. Tom Rowe, President & CEO, and Dan Sevilla, CFO resign from State Fund Executive Committee. General Counsel Carol Newman named Acting President & CEO, Chief Investment Officer Pete Guastamachio named Acting CFO, and Lisa Stolzy named Acting General Counsel. Organizational initiatives to improve efficiency and productivity continue. Operating expenses are reduced by $260 million, more than 25 percent since 2009, while doubling net income. State Fund closes out its first 99 years by strengthening its ability to provide California employers increased access to fair pricing with the launch of tiered rating, streamlined underwriting processes, and a new online price indicator for brokers called PriceNow. The State Fund brand promise is “to make possible and protect”. To be recognized as the industry leader and best value in California. State Fund exists to serve California's businesses as a strong, efficient and fairly priced choice for their workers' compensation insurance while making California's workplaces safer and helping injured employees return to work – all with no financial obligation to the public. State Fund is a stable provider of workers’ compensation insurance and a vital asset to California businesses. We help keep California’s entrepreneurial spirit vibrant. Broad skill set offering diverse and comprehensive products and services. In it for the long haul – we’ve never pulled out of the market due to an economic downturn and we never will. Since 1914, State Fund has helped keep the entrepreneurial spirit alive in California. Accessible and accepting of all – whether it be new ventures, hard-to-place industries or large businesses. State Fund provides peace of mind for employers and employees. Adjusters, loss control representatives, and industrial hygiene and ergonomics services are available statewide. California’s employers can depend on State Fund to be there with an open door providing the coverage and services employers need. State Fund offers California employers fair pricing for their workers’ compensation insurance. Strong and stable investment income and policyholder surplus along with nearly $20 billion in assets anchor State Fund financial stability. With around 130,000 policyholders and writing just over $1 billion in premium State Fund is California’s largest workers’ compensation provider, and is one of the largest w/c carriers in the nation. A unique resource to California, serving both large and small California businesses. Solid leadership and focused direction. A sophisticated business partner that California employers can trust. A seasoned and experienced staff of professionals. Always there - State Fund offers 24/7 online access to policy data, claim, and commission information services through State Fund Online. State Fund offices are all California based – from Eureka to San Diego, you can count on reliable and friendly service.